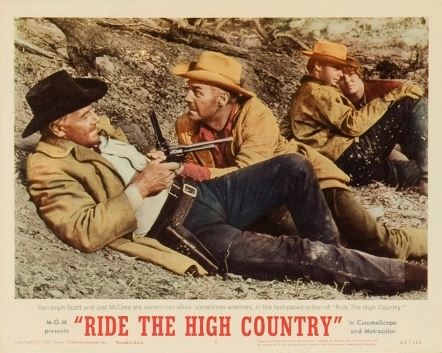 Sam Peckinpah's early career highlight Ride the High Country (1962), now regarded as a classic, was initially dumped into theaters as the lesser half of double features but eventually earned its own release. Filmed in just 26 days on location around Los Angeles with portions shot on the 20th Century Fox backlot, this revisionist Western marked a substantial leap in quality after the director's unimpressive The Deadly Companions a year earlier. Its ultimate success is for two reasons: terrific performances by Western icons Randolph Scott and Joel McCrea; and much more creative control for Peckinpah, who polished a script by William S. Roberts & N.B. Stone Jr. and edited the film with Frank Santillo, their first of several collaborations in the cutting room. The story goes like this: former lawman Steve Judd (McCrea) takes a job transporting gold on a four-day journey through the Rocky Mountains, shrewdly demanding $40 a day from local bankers and hiring two men as backup. Along for the ride are his former partner Gil Westrum (Randolph Scott) and Heck Longtree (Ron Starr), who currently serves as Gil's sidekick in a roadshow attraction. Agreeing to pay each man $10 a day for their work, Judd and company set out for the Coarse Gold mining camp where their precious cargo awaits. Six men have already died making a similar journey, and they're not looking to make it nine. Unsettling suspense strikes early in Ride the High Country, as we learn soon enough that Westrum and Longtree---initially resentful about earning half as much as Judd for doing the same work---are plotting to steal the gold for themselves on the way back. The threat of a double-cross is left to marinate during their ride to Coarse Gold, which also includes an overnight stop at the farm of religious zealot Joshua Knudsen (R. G. Armstrong) and his lovely daughter Elsa (Mariette Hartley). She's immediately interested in the handsome Heck Longtree, but will take just about any escape route at this point: father Joshua decries all outsiders as "sinful" and keeps her indoors, a recipe for rebellion as any young woman enters adulthood. So, against his wishes---and theirs, at first---Elsa joins Judd and company on the trip, claiming to have a suitor in Coarse Gold by the name of Billy Hammond (James Drury). When they finally arrive, things get complicated in a hurry. On the ride back home, they get even worse. The sole purpose of their trip---the gold, which only amounts to about $11,000 and is far less than they were expecting---takes a backseat during Ride the High Country, letting its characters and their interactions do most of the heavy lifting. The dynamic between Judd and Westrum is terrific; both actors had surprisingly never starred in a film together, and Randolph Scott even retired after being so pleased with the finished product (McCrea also initially retired, but was coaxed back into four more Westerns later in the decade). Young Mariette Hartley, still active in film and TV today, also shines here in her first acting role. 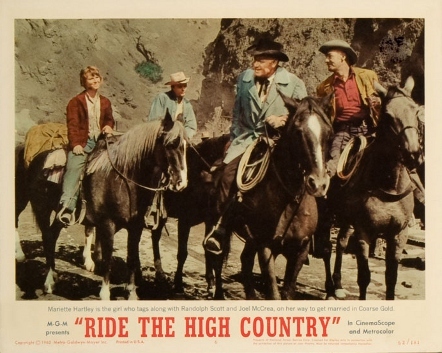 Yet it's the drama and suspense that ultimately carries Ride the High Country, punctuated by wide CinemaScope compositions, terrific editing by Peckinpah and Frank Santillo, and a truly memorable score by George Bassman. The film plays better than ever on Warner Archives' fantastic new Blu-ray, thanks to a new 2K scan and a handful of returning extras from the studio's 2006 DVD. Presented in its original 2.35:1 aspect ratio (aside from the opening credits and part of the first scene, which are boxed in a bit further on all four sides), Ride the High Country looks better than ever thanks to a sparkling new 2K scan and 1080p transfer that easily outshine the 2006 DVD. The film's excellent CinemaScope framing leads to plenty of memorable shots, with the Blu-ray squeezing out a strong amount of image detail, depth, texture, and beautiful color saturation that absolutely pops during the frequent outdoor sequences. Dirt and debris are basically absent, and no other glaring imperfections (noise reduction, compression artifacts) could be detected either. It's fantastic treatment of a deserving film, and die-hard fans will be extremely pleased. The audio is presented in its original DTS-HD Master Audio mono format and defaults to a two-channel spread, and what's here definitely reflects the era in which Ride the High Country was made. Dialogue and music are clear but not especially dynamic, there's modest depth at times, and the higher end feels more than a bit harsh on occasion. Still, it sounds exactly like a 55 year-old Western ought to, and I'd rather have flat mono than a faux-surround "upgrade". Optional English subtitles are included (again in ALL CAPS, except when someone is whispering), which makes a few moments of softer dialogue easier to decipher. Warner Archives' static interface is clean, simple, and easy to navigate, with separate options for subtitle setup and bonus features. This one-disc release is packaged in a standard blue keepcase with attractive artwork and no inserts of any kind. Everything from Warner Bros.' 2006 DVD, including an Audio Commentary moderated by Nick Redman with authors David Weddle, Garner Simmons, and Paul Seydor; the entertaining Featurette "A Justified Life: Sam Peckinpah and the High Country" (23 minutes); and the film's two-fisted Theatrical Trailer (3 minutes). Although the lack of brand new bonus features is again unfortunate, what's here still covers the bases nicely and will be appreciated by anyone who hasn't seen them yet. An early gem by a director who would make his name with future classics like Straw Dogs and The Wild Bunch, Sam Peckinpah's Ride the High Country remains a solid Western with terrific performances, very little fat, and a memorable score by George Bassman. It's the kind of Western that's got a little something for everyone; rough and unpredictable with no shortage of drama, it's aged very well during the past 55 years. Warner Archives continues their winning streak with another well-rounded Blu-ray release, serving up an outstanding A/V presentation and the same informative bonus features from Warner's 2006 DVD. It's an absolute no-brainer for die-hard Peckinpah fans, as well as a solid blind buy for anyone who enjoys the genre. Highly Recommended.